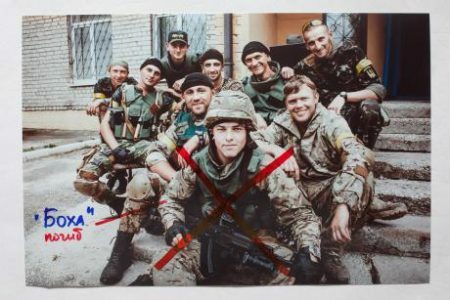 This photograph, which depicts Ukrainian soldiers, was torn down from the Direct Look exhibition. (c) Alexander Vasukovich. Source: FotoDoc. 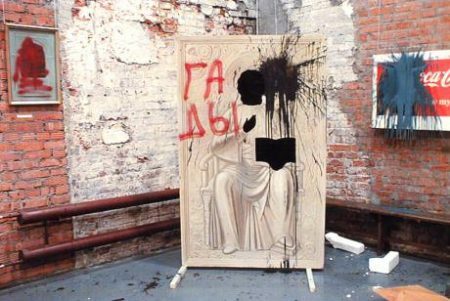 “Don’t make idols for yourself” by Alisa Zrazhevskaya after the 2003 attack on the Sakharov Center exhibition “Danger, Religion!”. Source: Sakharov Center. It’s become obvious that this was the first manifestation of a conservative turn which has now gripped all of Russian society. This turn was not simply decreed from on high, and was enabled by more than the country’s domesticated mass-media. Activists who go to galleries and theatres and force them to close are backed by popular support, even if it’s not always obvious. 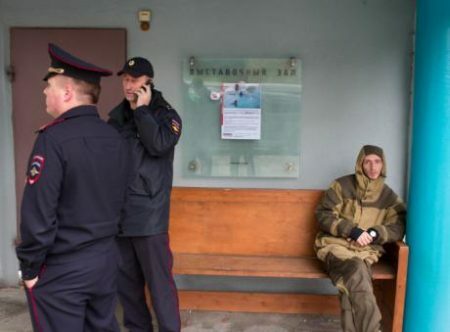 Police officers stand outside Moscow’s Sakharov Center as Cossacks, Orthodox activists and separatist volunteers protest. 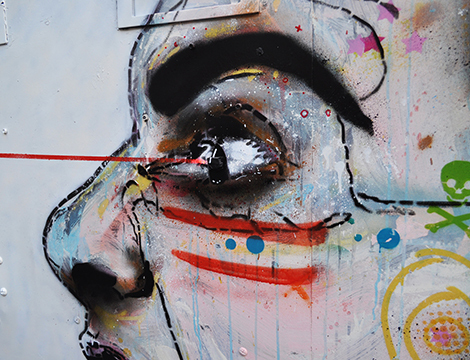 (c) Alexander Strakh. All rights reserved. Thus, this most conservative, even aggressively intolerant section of Russian society has learnt to master those tools of civic activism which had earlier been the preserve of leftists and liberals — everything from protests, social media and street art to “Occupy”. It once seemed that there were spheres of civic life immune to conservative radicalism. But no longer. Mikhail Kaluzhsky is Lead Russian-Language Editor at oDR. He is the author of Music Repressed (2007) and many documentary theatre projects. He can be found on Twitter via @kaluzhsky.